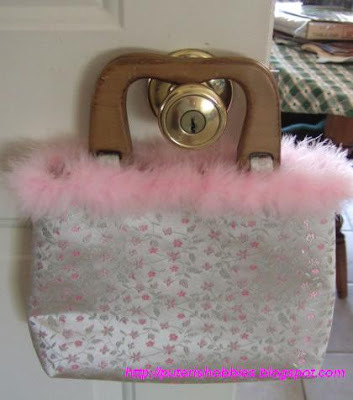 I made the bag the morning of the wedding, and I did not have the pink boa for the trim. I only added the pink boa later after I found it at the local Joann store. I think the boa trim makes the bag look classy. I will use more boa trims for future projects! In fact I have a piece of brown moleskin fabric that I'd like to make with brown boa trim, but I just can't seem to find brown boa. I think I'll go ahead and make the bag and add the trim later. Wow! You are one busy lady. Love you handbag creations! You are amazing! You are doing the things I love to do. Years ago, before I got married, I took up patchwork and made many quilts. I made each child a baby quilt when they were born (which they still use in the car when we travel locally). I made each a large quilt as they grew older and they treasure it dearly. I have much less time now and I have stopped quilting but my craft room is still full of fabric and stuff. I don't know what to do with all of it. Now, when I have some time, I make ear rings and sorts for the girls. Much as I love being creative with my bento boxes, I still love my patchwork! Lucky you! I never liked craft when I was a single woman .. I appreciated and admired my friends who did all kinds of crafts but I didn't do any myself. But since moving to the US with the availability of classes and materials, I have gone overboard. Lots and lots of fabric for quilting, and lots and lots of beads for beading! I have lots of fabric and handles for my bag projects too! Heheh. hi puteri. i absolutely adore your bags. especially the one with the rattan handles. love them! Thank you for the compliment! :-) You do nice stuff yourself and the food! Ahhhh... must check back your blog often for the recipes!